A year ago, the plugin “SEO Friendly Images” was quite dominating. We all were using it as a helpful friend for making our Images Search engine friendly. Is There Any Alternative For That SEO Friendly Dead Plugin? Well yes, there is. I plugin that I and my clients use is SEO Image Optimizer. This is a great plugin as it does the same job what SEO Friendly Images Did. I discussed About Adding ALT Tags into images in the Ranking article itself, so I won’t go in depth to explain them. Adding ALT tags are important for your Search engine rankings and you should definitely practice this. On The Top of it also gives an extra feature which makes images compressed and reduces its size. This helps images to load faster and hence it works as passive SEO Tool. The Beat Alternative To This particular Plugin seems to be SEO Image Toolbox. This plugin is the best if you face issues with The SEO Image Optimizer. Alt tags are dynamically generated and saved to the database automatically any time an image is uploaded, no configuration or a headache. These two plugins are the best Alternatives to SEO Friendly “The Dead” plugin and you may use them to generate automated ALT Tags. 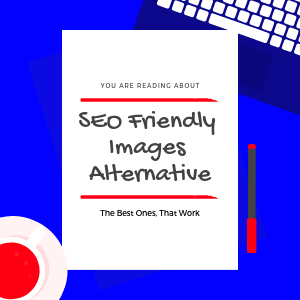 You would also like to read about how to automatically make your images SEO friendly. Tell me about the plugins you use in the comment section below.